This morning we visited a series of stone temples along the coast at Mahabalipuram with a world-class expert on temple architecture and Hindu history. While others will write about the cultural and artistic things we learned, I can’t, of course, resist talking about the wonderful rock itself. These ancient structures are made of the local granite, which is exposed in bare rounded mounds along the coast. This rock type is made of coarse crystals of clear quartz, yellowish feldspars, and black mafic minerals. The feldspars are especially vulnerable to dissolution in the humid climate, so this granite erodes relatively rapidly. The carvings thus appear to survive best on the local granite varieties which have the lowest percentage of feldspar in them. Paradoxically, the more feldspar in the rock the easier it is to carve. 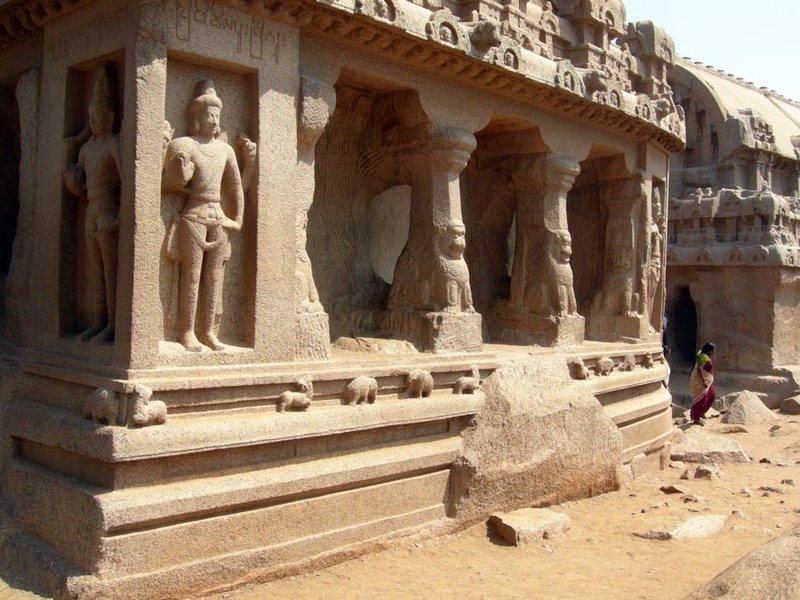 The Five Rathas produced in the 7th Century were the most interesting structures to me. They are unconsecrated temples carved directly into the bedrock and never separated from it. Artists and geologists say, then, that these are sculpted from “living stone”. This was especially appropriate for these temples as they are covered by delightfully detailed images of men, women and deities, and one of the structures is a free-standing, life-size elephant. Next to the complex the artisans left a set of the original granite mounds in their natural condition as a testament to their skill in carving living stone. As the Kingfisher jet pushed its way up through the humid, gray air of Delhi, we watched the colorful streets of the city fade and the vast north Indian plain open below us. The flight south to Chennai was a chance to see India from yet another perspective. The mark of humanity on the land was always visible, but the bones of the Earth show through the thin veneer. The dominant geological features in the north are rivers and streams meandering across the flat brown surface. They appear as thin threads of blue with sandy point bars too large for their current flow in this dry season. 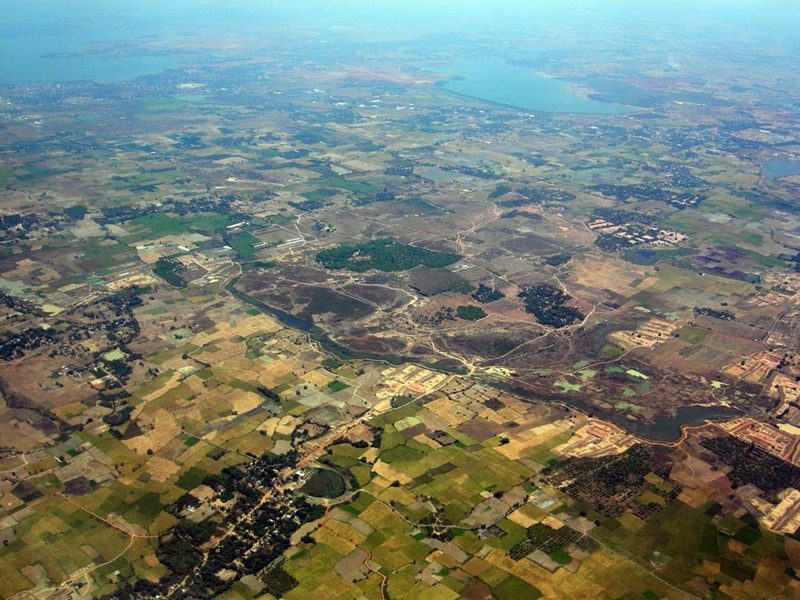 The floodplains, which are generally marked by the width of the meanders, are very large, in some cases intersecting so that vast regions must be under water during the monsoons. Agricultural plots cling to the sides of the water courses and extend outwards, following the fertile soil deposited in high water times. As we crossed over more hilly country, the number and size of the farmed areas diminished and numerous lakes began to appear, almost all with a visible dam which trapped the waters in long, narrow valleys. Small villages could be seen below the dams in the original river channels. During our descent into Chennai we passed over low mountains covered with deep green vegetation and punctuated by sharp white cliffs. When we crossed the coast of the Indian Ocean a large sandy beach stretched below us with a few tiny dots representing people walking the shore in the noonday sun. 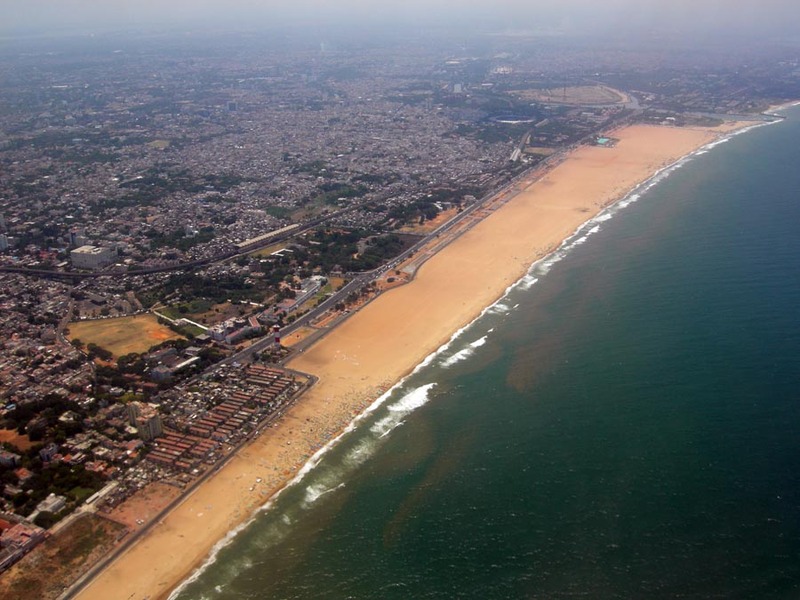 The longshore current was visible as a brown streak of water clinging to the shore and moving north Long stone groins stretched perpendicular to the shore to retard the flow of sediment into Chennai’s main harbor. Our trip to Devprayag, where the Bhagirathi and Alaknanda Rivers combine to produce the Ganges, began in Haridwar on the bank of the Ganges. This was the day that I could see India through the disciplinary eyes of a geologist. The rocks and landscapes we saw on our northward journey transcended the extraordinary human culture developed on them. Will Durant once wrote, “Civilization exists by geological consent”. This was a theme as we entered one of the most fascinating regions for any geologist. Haridwar is in the foreland basin south of the Himalayas. This was the first place in India I saw rocks exposed in low hills and mountains. These sedimentary rocks are folded in broad anticlines and synclines similar to a sheet of paper wrinkled on a table top by holding one side and sliding the other towards it. These folds pushed the rocks upwards, meaning they remained exposed above the thick alluvial plain deposits from the Ganges and other rivers. The boundary between the southern plains and northern mountains just beyond Rishikesh is dramatic. There is not the usual slow climb up a broad alluvial fan complex as is common when a major mountain range is approached. Instead here the alluvial fans here are very steep and short in width. The alluvial sediments of poorly sorted sands and boulders appeared as cliffs on the sides of the roads, and it wasn’t long before we were driving through the almost vertically-tilted metamorphosed rocks of the mountains themselves. These are the Siwalik Himalayas, the southernmost of the three Himalayan ranges. Steep mountainsides and short alluvial fans mean that this mountain range is very young, geologically speaking. This region continues to rise in elevation as the Indian plate to the south forces its way north into the larger Eurasian plate. The mountains begin at a faulted boundary, the most profound in the world, as a series of rock sheets thrust on top of each other. This is similar to a shelf of books, each pushed in one direction so they lie imbricated at a steep angle. We drove up the Ganges River Valley with the canyon (and very steep cliffs, I might add) off to our right. The river is large and quickly moving, but throughout its course we see evidence that at times it is much deeper and faster. Large boulders are motionless in its channel today, but could only have arrive there with a much more energetic and deeper flow. There are many extensive gray sand beaches perched high on the river banks far above the present river, and the rocks around them are scoured of vegetation. This river has a flood stage which is many times higher than the river we see. Our first view of Devprayag is from the road above (positionality = 30°8’42” N, 78°36’0″ E). Buildings cluster on the steep rocks of a point where the two rivers converge to make the Ganges. One river, the Bhagirathi, is clear and blue. The Alaknanda River which meets it is muddy. 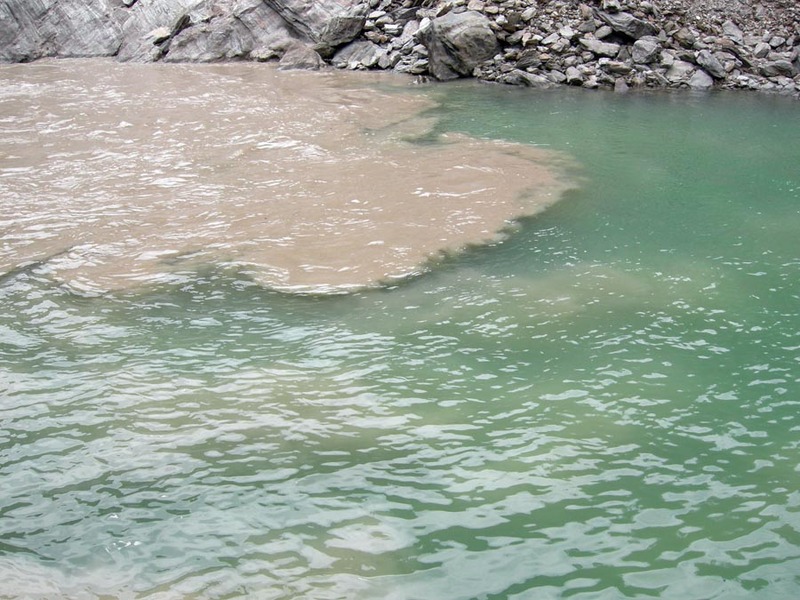 The resulting Ganges is muddy because the Alaknanda is larger and faster and thus carries much more sediment. The mixture of blue and brown waters at the confluence is fascinating. The sediment-rich waters swirl in a spiral which forces some of it up into the clear waters, allowing us to plot the converging currents. 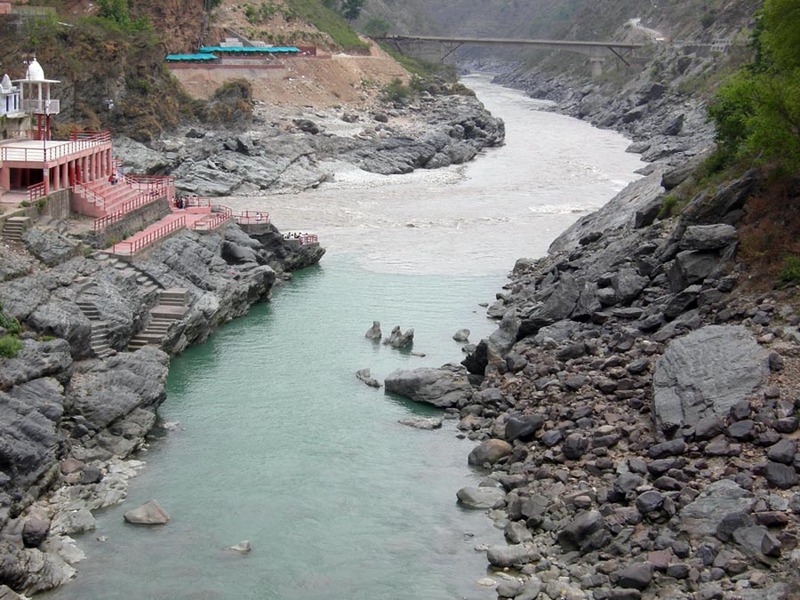 We walked down from the road to a suspension footbridge over the Bhagirathi River. In the middle of the bridge, standing motionless, was a beautiful brown cow who paid us no attention, even when we stroked its sides. 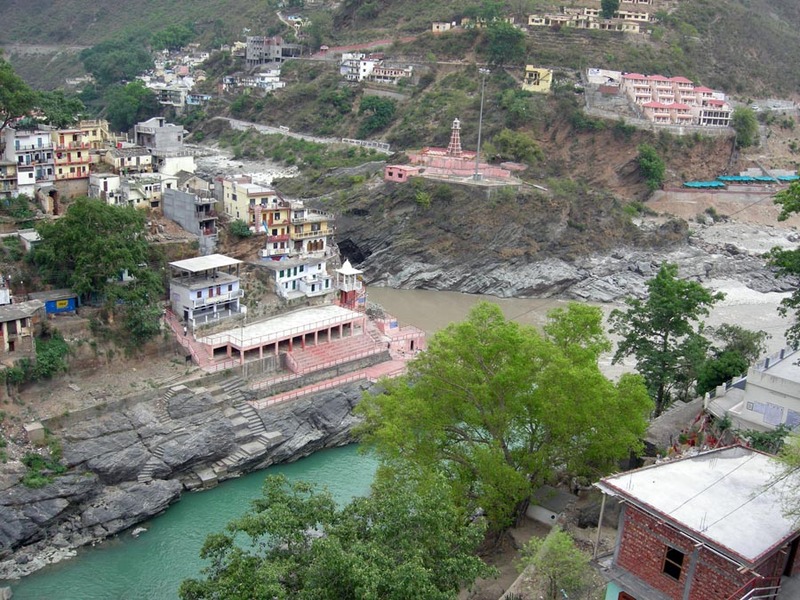 We walked through the town of Devprayag to reach the point on the bank where the three rivers converged. Feeling the strength of the water current on our bare feet was exhilarating, especially as we could look into three canyons from the same point. Huge standing waves of the Alaknada were just a few feet from us. Around our feet was a gray sand full of mica flakes, a bag of which will soon be part of a Wooster geology lab. I wish I could say I fully enjoyed our brief stay in Devprayag at the confluence, but there were several Hindu priests present the whole time who were anxious to pray for us, paint our foreheads, and, of course, relieve us of some of our rupees. They were so insistent that they would stand between us and the view, irritated that we were not participating in their rituals. There is a metaphor here for the relationship of science and religion, but it is too obvious to describe! As a geologist, this day was a pilgrimage for me. The Himalayas are one of the most active geological regions in the world, and they are the result of a plate tectonic process which still amazes us all. To touch the rocks and feel the waters was a kind of secular epiphany which brought together observations and concepts developed over my scientific career. It is a holy place in far more ways than the religious.